Suitable for Motorhomes, Sportshomes, RVs, welfare vehicles, horse lorries, race trucks, service vans etc. 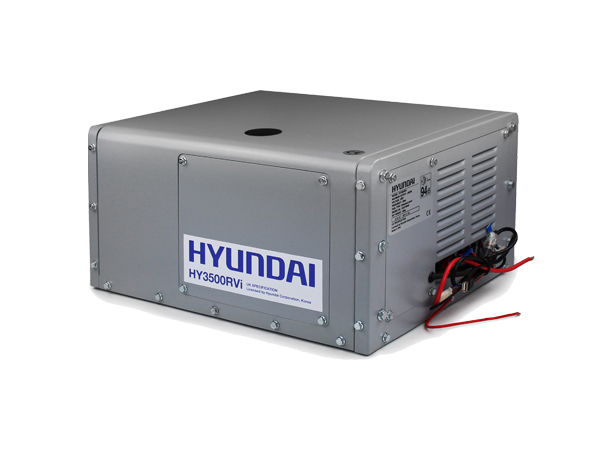 The Hyundai HY3500RVi is an inverter generator designed to be mounted underneath a motorhome, sports or welfare vehicle. It can be permanently mounted to the chassis or mounted within a locker on slide out mounts. Powered by the Hyundai IC225 4-stroke OHV petrol engine with electric start, electronic ignition and low oil level protection. The air-cooled engine draws in cool air around the sides of the canopy through a Tri-fan system to increase cooling and reduce noise and the hot air and exhaust fumes are directed downwards and expelled underneath the vehicle. The generator comes with an additional external exhaust silencer to be mounted underneath the vehicle to further reduce noise levels. The external 24 litre stainless steel petrol tank comes with mounting brackets and a filler tube and fittings to fit the filler in the outside panel of the vehicle. It incorporates a fuel pump and fuel level sender unit.This will give a run time of up to 24 hours with a light load and 12 hours under full load. Designed to offer low noise, low vibration and good fuel economy the HY3500RVi features a triple anti-vibration system, twin silencers, triple fan cooling system and digital inverter technology to reduce engine rpm and noise which increases fuel economy and engine lifespan, whilst delivering a fully overload protected pure sine wave clean power output. The digital control panel has a 6m cable to allow it to be mounted inside the vehicle and can start and stop the generator plus monitor fuel level, oil level, frequency, AC voltage, power usage, battery voltage and hours run. Choice of either slide out mounting brackets or fixed under chassis mounts, 24L stainless steel petrol tank includes fuel pump and sender, with mounting brackets and extended fuel filler tube with fittings, 6m cable and digital control panel, external silencer and flexible connecting pipe. Covered by the Hyundai two year warranty.